“Healthy pizza” might sound like an oxymoron, or like something you’d find in the freezer aisle of your local grocery store. 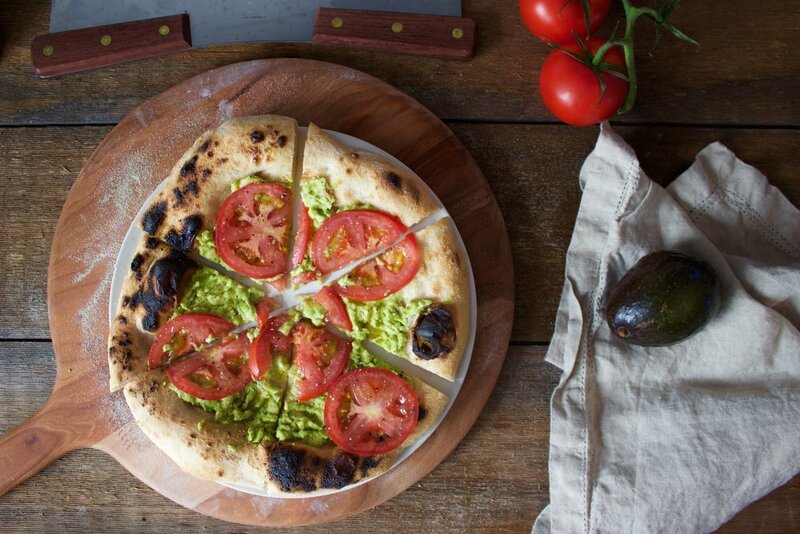 But this avocado and tomato pizza delivers on the promise. It’s so simple that it almost feels like a stretch to call it a recipe: bake the crust naked with ice cubes, then top it with mashed avocado and sliced tomatoes. In spite of the ease of preparation, the flavor rewards are rich. Every flavor shines through, and the contrast of freshly baked crust against creamy avocado with a touch of pique from lime juice and fresh, juicy tomatoes makes for a memorable experience. Try this one for a lighter dinner, or as an easy appetizer. It’s good, it’s healthy, and it just so happens to be vegan. Preheat the Baking Steel in your oven at 500F, use convection if available. While the oven preheats, in a large bowl, mix your mashed avocado with a splash of lime juice (to prevent browning) and season with salt and pepper to taste. Stretch or roll out your dough into a 12 inch round. Drizzle olive oil on top of your dough. Next, add three or four ice cubes in the center of the dough. Use a generously floured pizza peel to launch your pizza onto the Baking Steel and bake under the broiler for 2 minutes. After 2 minutes, open the oven and use your pizza peel to give the pizza a 180-degree turn. Turn off the broil setting but keep the oven at its highest temperature, and continue cooking for another 1-2 minutes, or until the crust has attained your desired brownness. Use your pizza peel to remove the pie from the oven. Top with avocado mixture and sliced tomatoes. Drizzle a bit more olive oil on top, to taste. Slice and serve.